I agree with Grunwald, after so much work the past few years there is no reason not to stick your boot into the UCL. Really do enjoy these updates. A good start to the season and I totally agree with everything said by Grunwald. I feel this could be the year you break into the Champions League group stages and also break the dominance of Salzburg. It would make for a fantastic season and a huge success, if I was right! In the first leg of their Third Qualifying Round tie, Die Vielchen were held to a frustrating goalless draw at the Generali Arena by Dynamo Kyiv. It means that next weeks second leg at the Olympyskyi is now a winner takes all clash between the two sides, although Die Vielchen will know that a score draw will take them through to the Play Offs through the away goals rule. 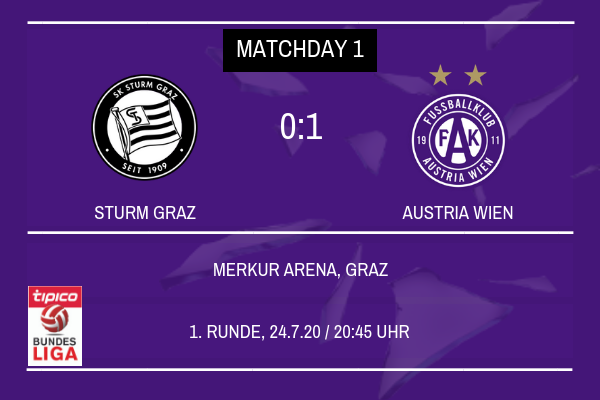 However here at the Generali Arena, Christopher Steegmann will be pleased with the performance of his goalkeeper Patrick Pentz who put in a stunning performance between Die Vielchen’s goal posts to keep Austria Wien in the tie, although it could have again been a different story had Austria Wien’s attacking players taken the chances they created too. Both Steegmann and Khatskevich named strong starting elevens for the first leg, with Steegmann setting his Die Vielchen side up in his favoured 4231 formation with his Belarussian counterpart favouring a 442 heading into the first leg. It meant that the game became an interesting tactical battle as both sides looked to gain control of the game in the middle of the park, but Dynamo Kyiv set up rigidly and with the aim of keeping Die Vielchen out which restricted the free flowing attacking game plan that Die Vielchen favour under their German manager. Despite the best efforts of the likes of Lucas Venuto, Dominik Prokop and Blessing Eleke, who replaced Marcel Canadi, who was taken off injured, Die Vielchen were unable to make the breakthrough in the home leg despite a raucous Generali Arena cheering them on. With the referee being more than happy to dish out yellow cards, Steegmann was forced into making tactical substitutions in order to avoid Austria Wien being sent down to ten men, with the likes of Christopher Martins Pereira and Gideon Mensah receiving yellow cards and ultimately being replaced by James Jeggo and Tomas Hubocan. It was these changes that disrupted Die Vielchen’s flow and rhythm and enabled Denis Boyko to keep a clean sheet in the Dynamo goal. Bright Edomwonyi and Artem Kravets were both guilty of missing chances that on another day they would have taken with their eyes closed, and it just wasn’t to be their day as both forward attacking line ups struggled in front of goal. 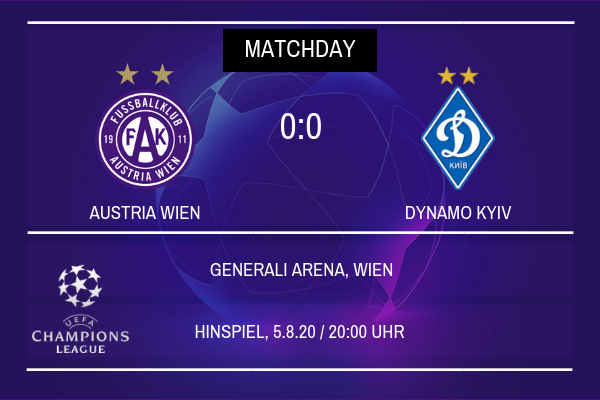 As previously mentioned, it means that a score draw will be enough for Austria Wien to progress to the final round of qualifying next week when the two sides meet again in the Ukrainian capital, whilst Dynamo Kyiv will hope that they can go one better and seal the victory in their home stadium and progress to the Play Offs. Jack: Would love to be able to push on through into the Champions League Group Stages, would be huge for the club and a real coup for me and the team! ScottT: We’re definitely coming for Salzburg in the league! Got a lot of work to do to break the Champions League! Not an ideal result, but it'll do as long as you can provide the goods away from home. The advantage certainly lies with Kyiv, although you still have a good chance. I'd take a lot of positives from that result. Even if it means you sneak one goal in in Ukraine, you're at a massive advantage given that Kyiv didn't manage to put one past you in Austria. Die Vielchen’s dreams of reaching the Group Stages of the UEFA Champions League were ended in the Third Qualifying Round for the second successive season tonight as Dynamo Kyiv walked away from the Olympyskyi with a 2-1 victory to seal their place in the final round of qualifying. 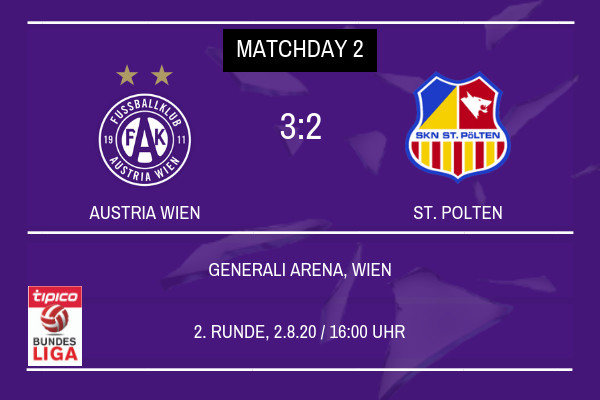 It was a spirited performance from Christopher Steegmann’s Austria Wien side but the Ukrainian giants were just too strong for their visitors and two stunning goals showed that, on this occasion the little bit of extra quality possessed by the home side was enough to carry them on through and relegate Die Vielchen into the Europa League for the second time in as many years. After the 0-0 draw in Wien last week, Die Vielchen knew that a score draw was enough to send them through and that if they could score the first goal, Dynamo Kyiv would have to score twice without reply to progress but unfortunately for Steegmann and his team the game didn’t work quite to plan. The home side knew that they were the heavy favourites to progress and with the might of the Olympyskyi behind them it was understandable as to why they were. Alexandr Khatskevich named a strong side in the same 442 shape that had nullified Austria Wien’s attack in the first leg in the hope that it would work to similar effect when the two sides met again in the Ukrainian evening. Sergiy Sydorchuk, one of the changes made to his starting eleven by Khatskevich was the man to break the deadlock on the night and in the tie in general. 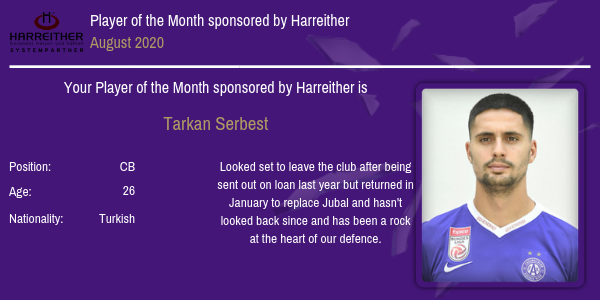 Within ten minutes the midfielder had surged into space outside the Austria Wien penalty area before unleashing a fierce effort which flew past Patrick Pentz and into the bottom corner to make it 1-0 to the hosts and give Die Vielchen the unenviable task of trying to claw their way back into the game. 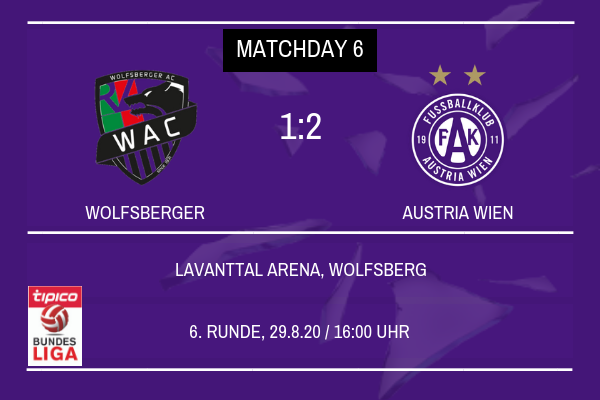 It had appeared that James Jeggo had found the equaliser for Austria Wien just eight minutes later, but his cushioned header past Denys Boyko was ruled out for a handball from the Australian midfielder, with large controversy surrounding the decision to disallow the goal. As a result it meant that the game was still very much in the balance and another Dynamo Kyiv goal would severely damage Die Vielchen’s chances by posing Steegmann’s side with the task of needing to score twice to pull level. With Austria Wien pressing for an equaliser on the night, Kyiv’s tactical plan worked out as Besedin was played into space before driving the ball past Pentz in the Austria Wien goal to make it 2-0 and consign Die Vielchen to the Europa League. 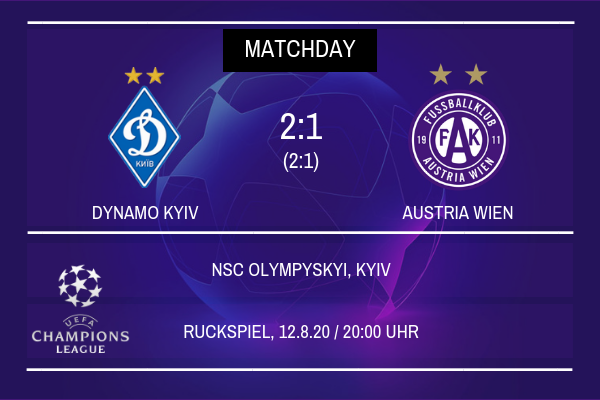 Lucas Venuto did provide Austria Wien with a spark of hope in the closing stages as he volleyed home a well timed finish from a tight angle with just minutes left on the clock but it wasn’t enough to light the fire that would see Die Vielchen comeback from defeat and ultimately it was Dynamo Kyiv that progressed into the next round of the competition. 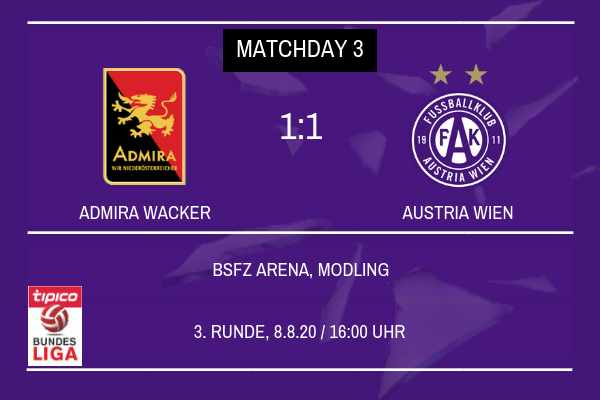 Austria Wien meanwhile will have another Europa League campaign to look forward to this season with the draw being made on Friday 28th August, once qualification for the competition has been finalised and the 47 teams joining Austria Wien in the Group Stages are known. 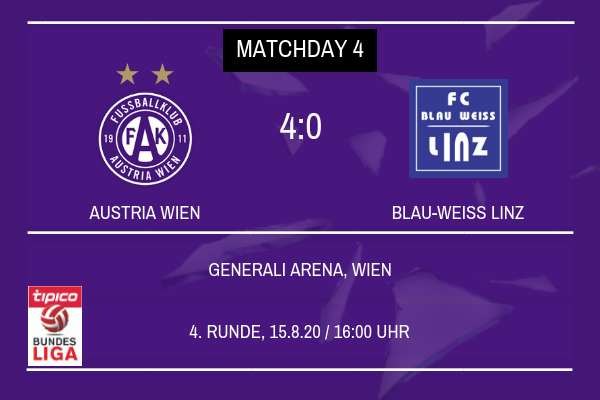 Steegmann and his coaching team will now turn their attentions to the weekends Bundesliga game against newly promoted Blau-Weiss Linz with Austria Wien looking to bounce back from the draw with Admira Wacker and return to winning ways on the domestic front. What a shame to go out in such a fashion, given the controversy over the disallowed goal. Hopefully you'll come back stronger next year, preferably as Austrian champions. For the time being, it's time to showcase your skills in the Europa League once again and hopefully go far in the competition. Absolutely gutting mate. With the disallowed goal it makes it even harder to swallow. Time for a good run in Europa League for now before doing the Champions League again next time around. Following on from the teams defeat to Dynamo Kyiv in the Third Qualifying Round of the Champions League, Die Vielchen officials were present at the Grimaldi Forum in Monte Carlo today as the draw for the Group Stages of the UEFA Europa League were made. 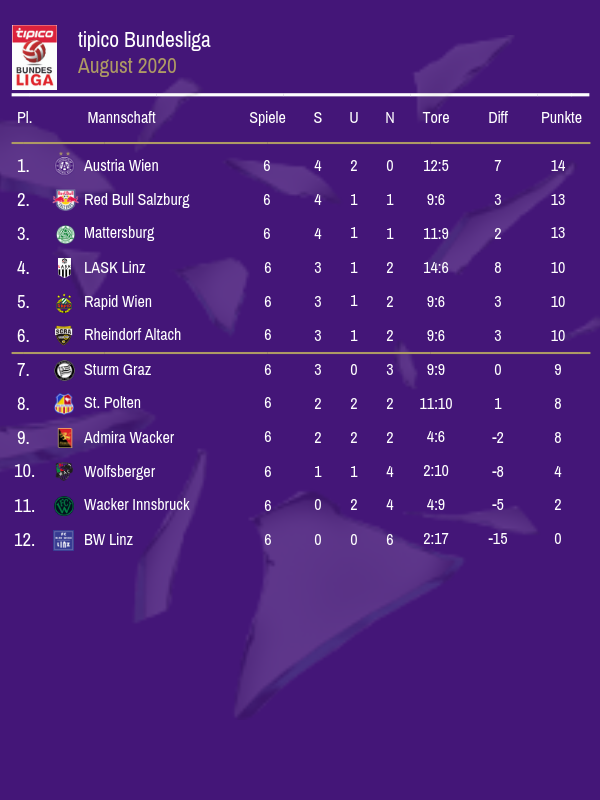 As a result of last season’s run to the Round of 16 of the competition where Die Vielchen were eliminated by Italian side Fiorentina, Christopher Steegmann’s side were seeded in the second pot of teams after a big boost to their co-efficient as a reward for last season’s performance in the competition and hopes were high for a draw that would give Die Vielchen every chance of progressing to the knockout stages of the competition once again. With the twelve teams ranked as first seeds having been drawn out, excitement built amongst the Die Vielchen representatives as they were drawn into Group K alongside German Bundesliga side Bayer Leverkusen. The tie with the Germans, managed by Markus Weinzierl, will add an extra story to Die Vielchen’s campaign with the Germans having relentlessly pursued Austria Wien number 1 Patrick Pentz for both of the last two summer transfer windows with Christopher Steegmann holding firm in his stance that the young Austrian goalkeeper was not for sale. Austria Wien then discovered that Italian side Torino would be joining them and Leverkusen in Group K with Polish Ekstraklasa team Lech Poznan being the fourth team in the draw. 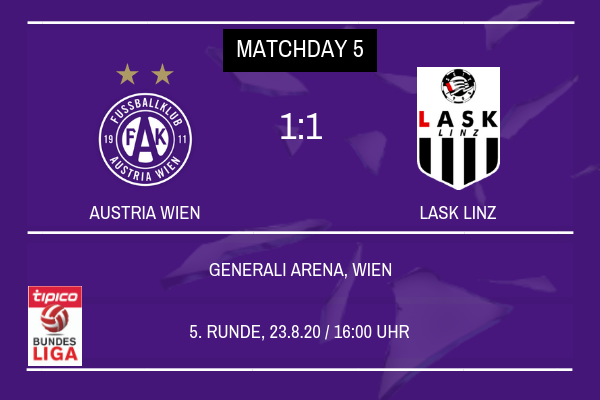 It means that Austria Wien won’t have far to travel when the campaign kicks off once club football returns after the September international break, with Die Vielchen kicking their campaign off away at the BayArena against Leverkusen on Thursday 17th September. Christopher Steegmann’s team will then host back to back home games with Lech Poznan the first team to visit on October 1st before Torino visit Thursday 22nd October. Two weeks later on November 5th, Die Vielchen will visit the Olimpico to face the Italians with the final home game of the campaign being played at the Generali Arena on Thursday 26th November. Austria Wien will then finish their Europa League Group Stage campaign away in Poznan at the Bulgarska on December 10th. 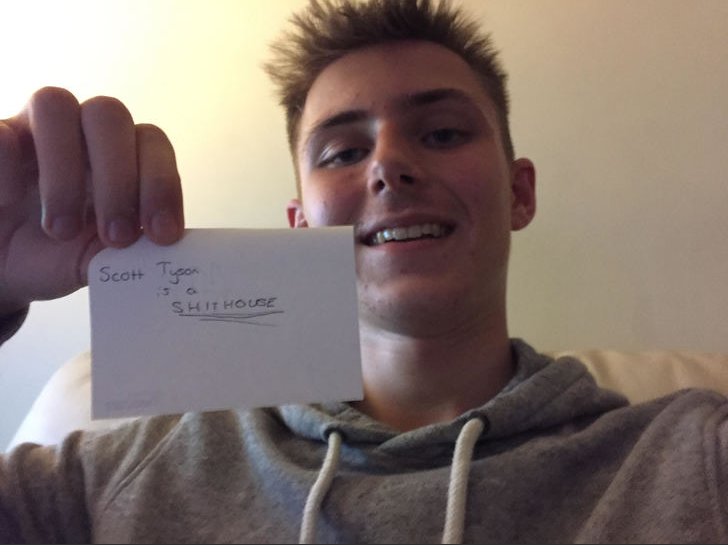 ScottT: It is bitterly disappointing, to not have made any progress in the competition is a real kick in the teeth but one we will learn from but like you said it’s time to make an impact in the Europa League! Jack: We proved last season we can do well in the Europa League so hopefully we can go one step further this year! 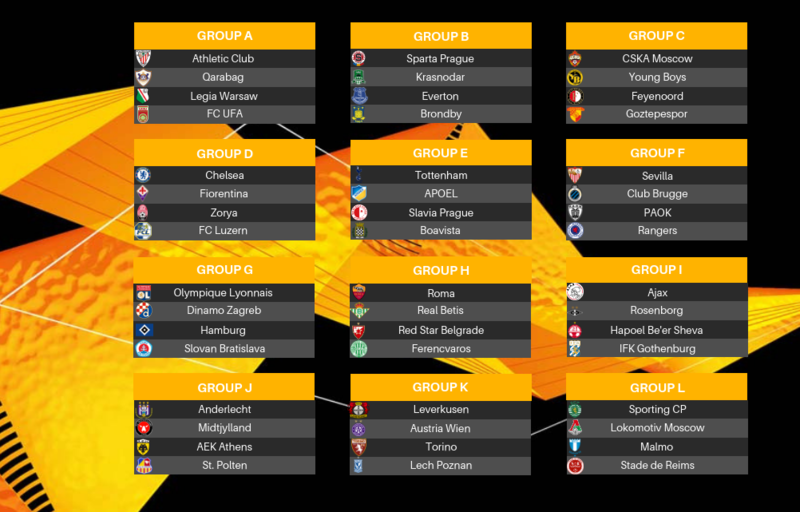 A difficult group with Leverkusen and Torino, especially. However, it's nothing you can overcome over six games. Gaining six points from six against the weakest side in the group, Lech Poznan, will be a necessity though. Quite a tough set of teams there... Even Lech are decent domestically, but like Scott said: points against them are vital. An incredible group to be drawn into. Some very historical clubs. Relish the challenge. Jack: All three teams are top sides domestically but so are we most importantly! Justice: The challenge is relished!